It occurred to me this morning that the military officials who oppose repealing "Don't Ask, Don't Tell" may not do so because they are anti-Gay or homophobic. Rather, to express a sexuality which is not of the majority is an expression of individuality. Individuality is something that the military finds important to suppress. The military seeks uniformity. Still, I believe DNDT should be repealed, but then, I find abhorrent the idea of surrendering one's individuality and independent thought in order to become someone else's cannon fodder. Driving to work this morning, flipping through the radio stations, I came upon Glenn Beck. He was speaking about his recent rally in Washington D.C. and how it would be remembered in history as "the beginning of the end of the oppression." He said that museums in the future would display artifacts from the rally and that the Smithsonian has already asked for materials from his rally (he may not be aware that the Smithsonian has also asked Al Sharpton for items from his rally of the same day and that, in fact, the Smithsonian pretty much always collects and stores memorabilia from rallys in the capital--from Immigration Reform to Gay Rights to Tea Party--which is why they've earned the nickname "The Nation's Attic"). Beck didn't mention if the Smithsonian asked for the bulletproof vest that he wore at the rally. Beck also asked his listeners to send him photographs from the rally and accounts of any miracles that occurred. Do people really take this man seriously? 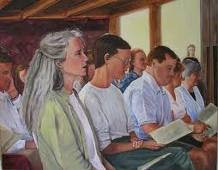 On Sunday we had a Quaker Meeting for Business at church. It begins with a community meal, then everyone present is given a copy of the church financial books--every dollar that has come in and how every dollar has been spent is visible. Anyone--man, woman or child--can ask questions or bring up points they would like to discuss. If a decision needs to be made, the entire community will listen together to try to hear what God is saying. No one pushes their own agenda. It is an amazing and refreshing process. And it works! In 1832--nearly 30 years before the start of the American Civil War--Joseph Smith, the founder of the Church of Jesus Christ of Latter-day Saints (the Mormons) purportedly had a vision about America's future. A prophecy is attributed to him which foresaw a great war between the Northern and Southern states (this is not all that remarkable since newspapers of the time were speculating about the same thing). The prophecy further claimed that as the war progressed, Great Britain would join in on the side of the South. Other nations would also become embroiled in the conflict, until it became a worldwide bloodbath. Ultimately, all of the nations would be destroyed. The Mormons (of course) would be spared. According to the earliest written accounts of this prophecy, these events would "cometh quickly." The prophecy was eventually printed in several LDS publications including 'The Pearl of Great Price' (1851), 'The Seer' (1854) and 'Doctrine and Covenants' (1876). Added to this prophecy was the LDS teaching that these events would not quite completely destroy America, but that the U.S. would be saved at the last moment by Mormons. After this near-destruction and rescue, a "theodemocracy" (Joseph Smith's term) would be established in the U.S.; the Latter-day Saints would return to Jackson County, Missouri to build the New Jerusalem; and then Christ would return, reigning from Missouri alongside the LDS. "Brigham Young and other preachers are constantly inculcating in the minds of the crowded audiences who sit beneath their teachings every Sabbath that the United States is of no consequence, that it lies in ruins, and that the prophecy of Joseph Smith is being fulfilled to the letter. According to the prophecy, the United States as a nation is to be destroyed. That the Gentiles, as they call all persons outside of their church, will continue to fight with each other until they perish and then the Saints are to step in and quietly enjoy the possession of the land and also what is left of the ruined cities and desolated places. And that Zion is to be built up, not only in the valleys and the mountains but the great center of their power and glory is to be in Missouri where the Saints under the lead of their prophet were expelled many years ago." In another letter, Harding wrote, "In all the meetings that I have attended, not one word, not one prayer has been uttered or offered up for the saving of our cause and for the restoration of peace, but on the contrary the God of the Saints has been implored to bring swift destruction on all nations, peoples, and institutions that stand in the way of the triumph of this people." The end of the Civil War did not stifle the Mormon vision of destruction. In 1868, three years after the war's end, Brigham Young wrote "[O]ur government, the best government in the world, is crumbling to pieces. Those who have it in their hands are the ones who are destroying it. How long will it be before the words of the prophet Joseph will be fulfilled? He said if the Constitution of the United States were saved at all it must be done by this people. It will not be many years before these words come to pass." That same year, Mormon leader Orson Pratt wrote that soon the Saints would "...visit the ruins of mighty towns and cities scattered over the face of this land destitute and desolate of inhabitants." Joseph Smith had given many statements and prophecies along similar lines. For example, during a speech in July of 1840 he said, "Even this nation will be on the very verge of crumbling to pieces and tumbling to the ground and when the Constitution is upon the brink of ruin this people [the Mormons] will be the staff upon which the nation shall lean and they shall bear the Constitution away from the very verge of destruction." A description that Joseph Smith used on multiple occasions was that during this time of destruction and peril, the United States would "hang by a thread." According to Brigham Young "...as Joseph Smith said, 'The time will come when the destiny of the nation will hang upon a single thread. At that critical juncture, this people [the Mormons] will step forth and save it from the threatened destruction.' It will be so." According to the Foundation for Apologetic Information & Research (a pro-Mormon apologetic organization), "The idea of 'hanging by a thread' has become part of the literature and lore of the LDS community." As time passed, the fulfillment of this prophecy seemed less and less likely, yet, according to Mormon researcher Richard Abanes (author of ‘One Nation Under Gods: The History of the Mormon Church), "Throughout the twentieth, and now into the twenty-first century, the belief [in the prophecy] has continued to be an integral part of Mormonism." There are many other examples of LDS leaders invoking Joseph Smith’s prophecy. In 2008, during an interview with Utah Senator Orrin Hatch, Glenn Beck stated, "I mean, when I heard Barack Obama talk about the Constitution and I thought, we are at the point or we are very near the point where our Constitution is hanging by a thread." So what does all this mean? First, most modern-day Mormons are very patriotic people who love America and love the Constitution. Second, for 180 years, Mormons have been watching for a time when the Constitution (and, by extension, the United States of America) will be nearly destroyed by internal forces. Third, Mormons believe that they will be the ones to save America and, in the process, be triumphantly recognized as the true church of God and usher in the return of Christ. This means that, according to the teachings of the LDS church, the decline and fall of America is something to look forward to. Glenn Beck is a devout Mormon. In recent years he has incorporated more and more teaching of LDS doctrine into his television and radio broadcasts (here is an example from July of 2010). What most people don't realize is that one of the key motivating forces behind Beck's "gloom and doom" rhetoric are these Mormon end-time prophecies from the 1800's. This is the lens that Beck sees America through. This is what he is looking for in current events. Like Brigham Young and the Saints in Utah during the Civil War, Beck is energized by the possibility of America's downfall. So why have millions of Evangelical Christians turned to a Mormon talk radio host to shape their political and moral views? Part of the reason is that Beck's dire prognostications fit well with the Dispensationalist "Left Behind" end-times theology held by many American Christians. Both see the nation and the world as going from bad to worse just prior to Christ's return, and derive a certain amount of fascination from watching it unfold. Many Evangelical Christians are unaware of the vast and fundamental differences between LDS and Christian beliefs. Most are unaware that the "truth" which Beck broadcasts is heavily tainted with Mormon theology. Very few American Evangelicals realize that this Mormon theology they are imbibing foretells the ruin of their own faith and government. So why not just smile patronizingly at Beck, his listeners and Joseph Smith's prophecy, and go on with our business? My concern is something called the "Thomas theorem" which states that "If men define situations as real, they are real in their consequences." In other words, how people perceive reality defines how they act. Actions are affected by *perceptions* of reality, not by reality itself. According to the "Thomas theorem", objective truth is not nearly as important a factor in directing people's actions as a subjective interpretation is. Wikipedia puts it this way, "According to Thomas, people react not only to the situations they are in, but also, and often primarily, to the way they perceive the situations and to the meaning they assign to these perceptions. Therefore, their behavior is determined in part by their perception and the meaning they ascribe to the situations they are in, rather than by the situations themselves. Once people convince themselves that a situation really has a certain meaning, regardless of whether it actually does, they will take very real actions in consequence." As the axiom goes, "Perception is everything." One consequence of the "Thomas theorem" is the phenomena of self-fulfilling prophesies: A man believes his wife is cheating on him and, as a result, acts in such a way as to cause his wife to begin cheating on him. A rumor gets around a small town that the local bank is in trouble and about to close down. The rumor is false but, as a result of it, the townspeople make a run on the bank and withdraw all of their funds, overwhelming the bank and forcing it to close down. Could Joseph Smith's American Apocalypse become a self-fulfilling prophecy at the hands of Beck and his disciples? 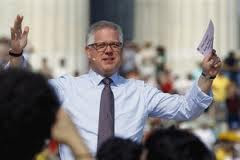 If Beck believes that "we are at the point or we are very near the point where our Constitution is hanging by a thread", then does he see himself as one of those Mormons who will save it and usher in the "theodemocracy"? One need only look at historical and contemporary theocracies (from Ancient Rome to Catholic Medieval Europe to Calvin's Geneva to Puritan Massachusetts to the Mormon State of Deseret to Saudi Arabia to Iran) in order to see that, more than anything, they tend to resemble the very Fascism which Beck claims to want to save us from.